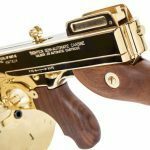 Auto-Ordnance: Gold, Chrome Versions of Thompson 1927A-1 "Chicago Typewriter"
The Auto-Ordnance Thompson 1927A-1 semi-automatic carbine is now offered in a Titanium Gold finish and also a Polished Chrome. 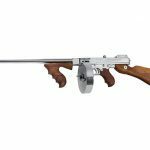 Auto-Ordnance is proud to introduce an exciting and classy look to their century-old Thompson, historically referred to as the “Chicago Typewriter”. 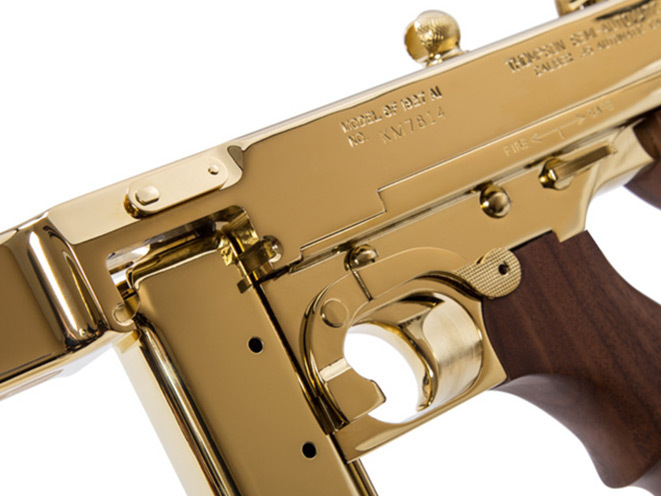 The Thompson 1927A-1 semi-automatic carbine is now offered in a Titanium Gold finish and also a Polished Chrome. Either of these time-honored reproduction semi-auto carbines will undoubtedly impress your friends when you take it out to the shooting range. 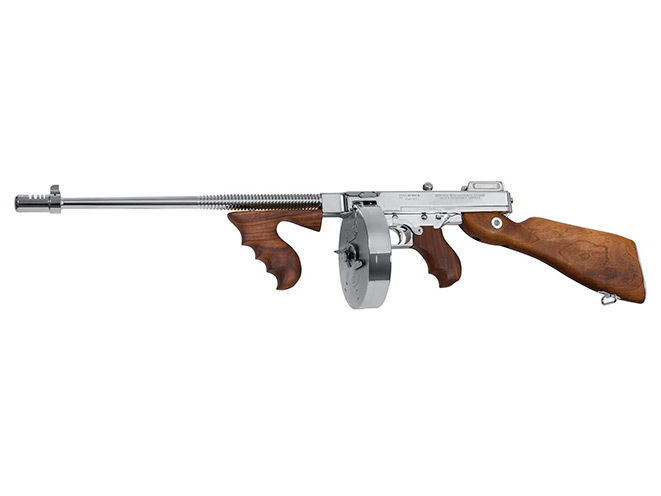 These guns are offered in .45 ACP and have a 16.5” finned barrel (18” with compensator), with a 1 in 16 right-hand twist. 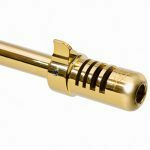 The frame is constructed in steel with either a Titanium Gold finish or a Polished Chrome finish. The gun weighs 13 lbs. and has an overall length of 41”. Other features include a pinned in front blade and an open rear adjustable sight. The stock is fixed and is made from luxurious American Walnut and has a vertical foregrip. 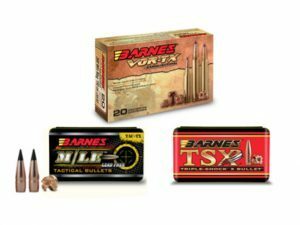 These two new models each ship with one 50-round drum and one 20-round stick magazine. The magazines too are plated in either polished gold or chrome. 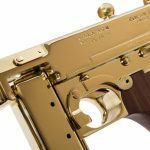 Both the Titanium Gold (Model Number T150DTG) and the Polished Chrome (model number T150DCR) carbines are shipped in a protective hard case which features both the distinctive Thompson logo and the words, “Chicago Typewriter”. 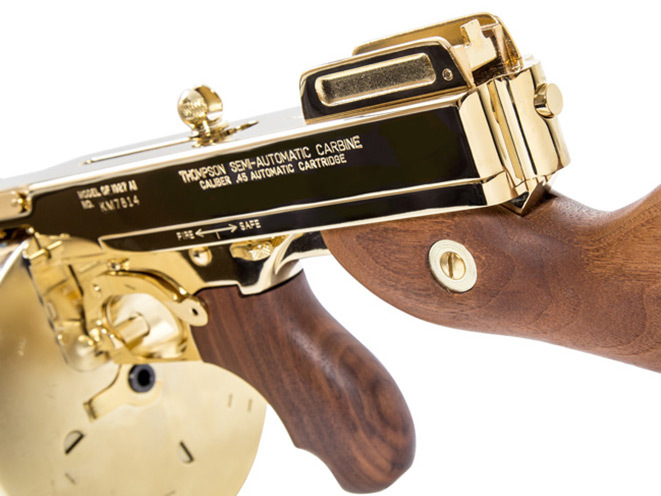 To truly capture the 1920s gangster era, an aftermarket violin case can be ordered for the Gold or Polished Chrome Tommy Gun. 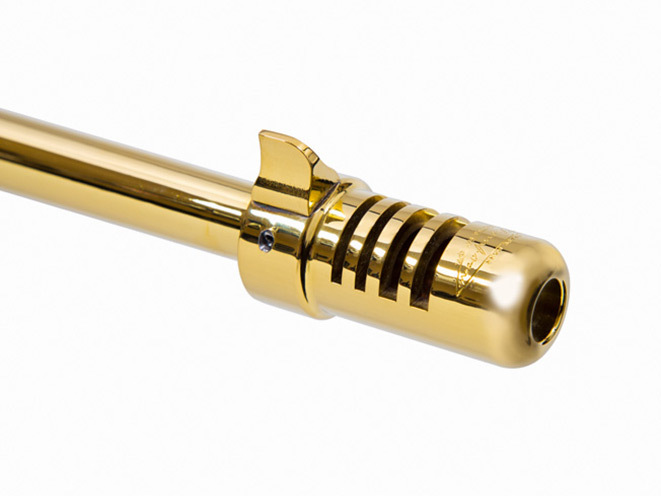 For a limited time only, the introductory MSRP is $2963 for either the Polished Chrome or the Titanium Gold. The cost of the violin case is an additional $221.00.